CLEVELAND - Teoscar Hernandez made the most of his season debut, driving in the go-ahead run with a single off All-Star Andrew Miller in the seventh inning as the Toronto Blue Jays rallied for a 8-4 win over Cleveland, snapping the Indians' five-game winning streak on Friday night. Hernandez, who was recalled earlier in the day when the Blue Jays placed third baseman Josh Donaldson on the 10-day disabled list, added an RBI double in a three-run ninth. Steve Pearce also doubled in a pair of runs in the ninth for Toronto, which trailed 4-0 after two innings but came back against Zach McAllister (0-2) and the normally unhittable Miller. Aledmys Diaz's three-run homer helped the Blue Jays tie it 4-4 in the fourth against starter Mike Clevinger, who was spotted an early lead and coasted through the first three innings before running into trouble. Danny Barnes (1-0) pitched one inning, and three other relievers finished up for Toronto. 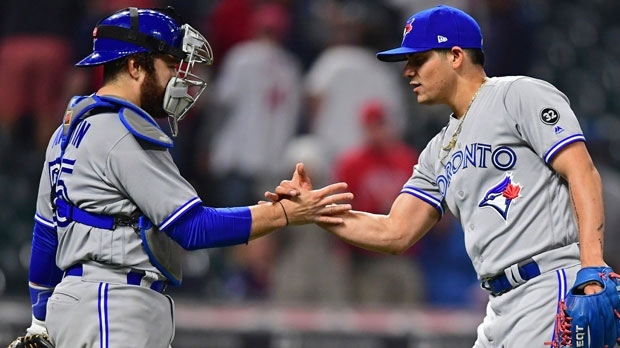 With starter Marcus Stroman in trouble from the outset, the Blue Jays looked like they were in for a long night before storming back, helped by catcher Yan Gomes' two-out passed ball in the seventh.